Antonios begins with a short introduction, after which he analyzes the first scene of the film shot by shot. It’s a relatively long scene (4:47), with an average shot length of about 20-30 seconds. The first couple of minutes consist of dream-like shots of nature, a man pensively strolling through it. We hear water and birds and nothing else. No space ships, no suspense, hardly a sliver of a plot. Why does Tarkovsky kick off his science fiction film – which, by the way, does feature space ships, suspense and heaps of plotting – with nature shots? The video does a great job of pointing our attention to how the scene is broken down, but does not consistently give us an idea why this specific scene is the first scene of the film. After some thinking, I landed on three reasons. 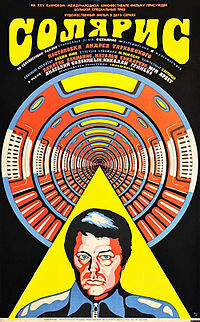 Solaris doesn’t feel like a slow film to me. That’s because the first scene is slower than most of the rest of the film. A film feels slow if it seems to slow down towards the end or has a sluggish middle, not because the beginning is slow. On the contrary, the slow start of Solaris prepares our minds for what’s to come: we settle in the slow pace at the very beginning of the film, and as a result, later scenes that are only slightly faster than this first one feel zippy and dynamic. Tarkovksy needs us to get accustomed to his pacing immediately, to be able to play with rhythm the way he wants. In Solaris, this is evident in his relentless focus on theme. As the video shows, water is an important theme in Solaris, and specifically water as a symbol for memory. So the first shot of the film is a shot of water not because it introduces the location, but because it is the main theme of the film. The reasons for opening the film with slow shots of water may now be clear. But why introduce protagonist Kris Kelvin’s father and his house so deliberately and detailed? Because Tarkovsky wants us to remember the father and his house. Throughout every scene we see in Solaris, he reminds us in small ways of earth, childhood, home, of a place we can never return to. When, finally, after traveling with Kris to the other side of the universe, the film returns to the father and his house, we understand the meaning of the first scene. That’s the emotional pay-off: remembering the first scene while watching the last, we learn how time sculpts our thoughts on home and time itself.